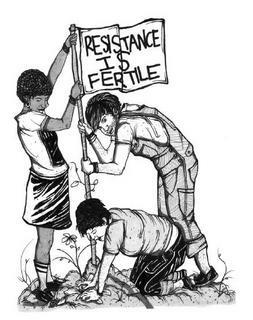 “More than 3,500 families started squatting on farmland in the provinces of Yoro, Cortes, Santa Barbara, Intibuca, Comayagua, Francisco Morazan, El Paraiso and Choluteca on Tuesday—the International Peasant Day of Struggle,” according to La Via Campesina, International Peasant Movement. 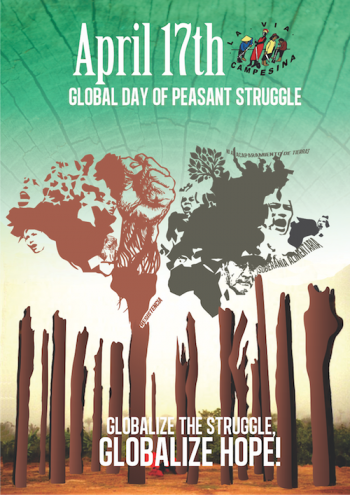 More than 200 actions and activities had been planned worldwide for A Global Day of Peasant Struggle on Tuesday, April 17. Note: This revised press release now contains a paragraph about a possible protest by medical transcriptionists, one of the most abused vocations in the industry. 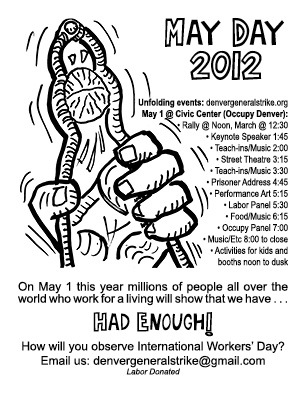 Working people the world over will assert their power this International Workers’ Day, May 1, and Denver will be represented, according to the Denver General Strike Coordinating Committee. The Committee, an offshoot of the Denver-Boulder Industrial Workers of the World union, is, along with Occupy Denver, coordinating a variety of activities to protest the subordination of workers and celebrate the holiday. Leading up to May Day, the Committee has joined with post office workers, teachers and transportation workers in mass actions against cuts in funding, programs, services and jobs. 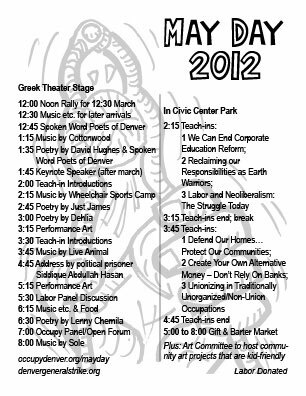 In metro neighborhoods, both the General Strike Committee and Occupy Denver are encouraging residents to meet in their common spaces or parks to create support and self-determining assemblies, as has been done especially in Spain and Greece in response to corporate and government austerity moves. New Paragraph: One possible national action is a protest by medical transcribers (MTs). For years, as with many other vocations, transcribers have been subjected to increasing pressure from boosts in workload, cuts in compensation, and more and more unpaid tasks (attending HR meetings, recording time worked, and reviewing email, are only a few examples). Some companies take advantage of MTs’ independent contractor status, which means workers do not get traditional benefits (including unemployment compensation), and do not have the rights that a worker with employee status has. Many who are home-based workers find it impossible to meet increased quotas and are not making minimum wage. Hospital MTs are increasingly being outsourced and finding that they cannot make a living at the companies who do the outsourced work. Outsourced workers often find that the output demands have skyrocketed so much that they, even the most experienced of them, have to clock out at the end of the day and then toil on their own time to make minimum quotas, which is an illegal, “wink-wink” policy, yet the practice continues. Another issue with broader connections is support for the window-and-door manufacturing workers in Chicago. In 2008 these workers made national headlines when they took over their plant, then owned by the Republic Windows and Doors Company, rather than allow its closure. When the subsequent owners, Serious Energy, announced plans to close the plant again earlier this year, the workers again seized the plant and won a 90-day period to find a new owner or buy and run the plant themselves. That period ends May 24 and local solidarity organizers are watching the outcome with interest, especially in case solidarity activities are required at Serious Energy’s two plants outside of Boulder. Both the Denver General Strike Committee and Occupy Denver have also been contacting local businesses who may be closing Tuesday, May 1, in commemoration of International Workers’ Day. One such business is the Mercury Cafe, a long-time restaurant and performance venue northeast of downtown Denver. 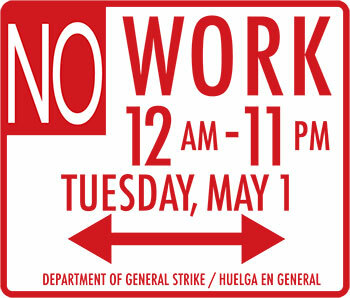 P&L Printing, an IWW job shop, and the affiliated P&L Press Infoshop, also will be closed for May Day. Those who are engaged in May 1 activities are urged by the Denver General Strike Committee to contact them to help develop a network of ongoing mutual support. An issue with broader connections is support for the window-and-door manufacturing workers in Chicago. In 2008 these workers made national headlines when they took over their plant, then owned by the Republic Windows and Doors Company, rather than allow its closure. When the subsequent owners, Serious Energy, announced plans to close the plant again earlier this year, the workers again seized the plant and won a 90-day period to find a new owner or buy and run the plant themselves. That period ends May 24 and local solidarity organizers are watching the outcome with interest, especially in case solidarity activities are required at Serious Energy’s two plants outside of Boulder. 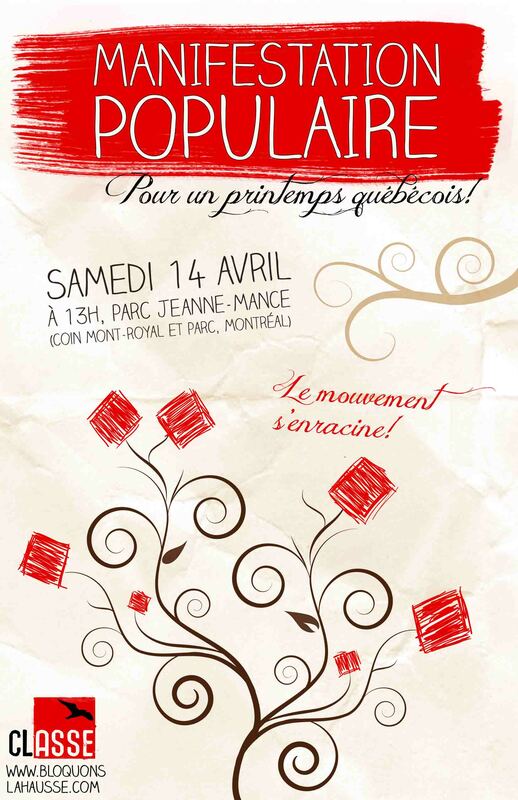 The two-month-old student strike in Montreal, the longest in Quebec history, comes in the face of tuition hikes of $325 a year for five years. Visit Stop the hike to read what the students are saying. 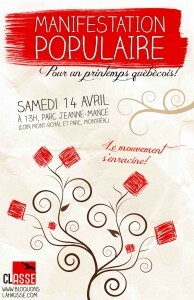 Popular Demonstration/ For a québécois spring!/ Saturday 14 April/ The movement takes root! Ironworkers in Chorzow, Poland earlier this month pulled a wildcat strike due to layoffs and use of contractors. They received support from local people—including 500 football fans. Read about it on libcom.org. 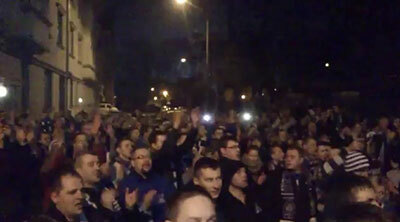 Soccer fans chant and sing outside the metalworks in Chorzow, Poland. Click to see video. Three weeks ago at our Coordinating Committee meeting, we had yet another brief discussion of the dynamics of our situation: putting out the call for observance of International Workers’ Day, in whichever way the working people of Denver see fit and will manage. That same day, Jeremy Brecher, who has done a lot of writing on labor and social movements over the years, published “Occupy May Day: Not Your Usual General Strike” based on his talk addressed to Occupy University, Zuccotti Park, in which he delves into the back-story and brings us up to date. Continuing, Brecher spoke to a point that Ric raised in the February 25 consulta that our Committee held, i.e., how the calling for a general strike doesn’t cause it to occur. And Brecher essentially summarizes the approach we were taking in our Committee early on when we discussed “what victory would look like” on May 2, 2012. Brecher then outlines particular possibilities, calling May Day a “teachable moment.” He discusses the dynamic between Occupy and traditional unions, especially in the context of calls for a general strike. He concludes by recalling the millennia during which May Day was a celebration of nature—a nature on the precipice in 2012. Definitely worth reading. Read the entire article here.